Welcome to Station Hollywood. The permanent junction for the moving train of images. Its all about Movies, Myths built around them, the stories, the facts and all things unsaid. Happy birthday to Moushumi Chatterji. The viewers of bollywood films wish happy birthday to Moushumi Chatterji on 26th April, 2018. Moushumi Chatterji, the Bengali actress acted both in Bengali and hindi films and showed her skills in both of them. She acted in the Bengali film Balika Badhu, where the film was based on child marriage and impressed the directors and producers with her performance. From that time she ventured in Bombay and tried her luck in bollywood industry. Her film Anurag opposite Vinod Mehra became super hit. She played the role of a blind girl and got appreciation of the crowd. The songs in the film became very successful including songs like “woh kya hai” sung by Rafi. SD Burman composed the music of the film. She acted in action films like Goutam Govinda. The film was related to the story of Shashi Kapoor, a police officer who came to the village and trained all the rustic villagers the manner of self-defense. Shatrughun Sinha was his own brother, which was disclosed at the end of the film. Moushumi Chatterji showed her humour in the respective role. Moushumi also acted in suspense-thrillers like Benaam, opposite Big B, where there the anxiety relating to the kidnapping of her son was at issue. She expressed her feelings very well in the film. She was brilliant in the film Manzil Manzil, opposite Big B. It was the remake of Mrinal Sen’s Bengali film Akash Kushum. Akash Kusum was based on the story relating to Soumitra Chatterji presenting a false story about himself before Aparna Sen with the help of his friend Shubendu Chatterji. In the hindi version also the story line was not changed. Moushumi Chatterji’s smile had a beauty of its own which she expressed in majority of films in style. While acting in a number of bollywood films, she stormed Bengali films with her performance in the super hit film Ogo Bodhu Sundari, opposite Bengali superstar Uttam Kumar. The film was released in 1980. The story was based on how Uttam Kumar, an academician brought a girl from the streets and taught her literature. Moushumi expressed the difficulty of forgetting her rustic language which she adopted from the environment she came from and learning the new language. The music given in the film by Bappi Lahiri became super hit. Songs like “ami ekjon shantoshisto”, “shudhu tumi nou obolakanto”, etc., sung by Kishore Kumar became super hit. It was incidentally the last film of Mahanayak Uttam Kumar. Her comedy conception was used by Gulzar and other directors very successfully. Her film Angoor opposite Sanjeev Kumar showed her comedy skills. The film was based on Uttam Kumar’s film Bhranti Bilas and had similarity with Shakespeare’s play Comedy of Errors. Sanjeev Kumar played the double role in Angoor that was played by Uttam Kumar in the Bengali film Bhranti Bilas, while Moushumi Chatterji played the role of his wife which was played by Sabitri Chatterji in the Bengali film. The two brothers were identical twins and Moushumi Chatterji got confused with her own husband and his brother. Deven Verma played a double role along with Sanjeev Kumar as his servant. Her other successful films included Pati Patni Aur Woh, opposite Sanjeev Kumar, Ghayal, as the sister-in-all of Sunny Deol and many other films. Even she had acted in landmark Bengali films like Kori Diye Kinlam based on the epic novel of Bimal Mitra. In 2013, she had acted in successful Bengali film Gainar Baksho. She had acted in the role of a widow who died and the spirit of the widow tortured the other women in the family. She acted with Konkona Sen Sharma and Srabanti Chatterjee in the film. The viewers expect Moushumi to contribute in character roles in bollywood films in future. Amitabh Bacchan, Shahrukh Khan gave fantastic speech in inauguration of 20th Kolkata International Film Festival. The 20th Kolkata International Film Festival 2014, started off with a brilliant inauguration in Netaji Indoor Stadium on 10th November, 2014. It was a brilliant occasion by every standard. Mamta Banerjee, the Chief Minister of West Bengal managed to invite the major dignitaries from different parts of the world and especially India. The 8 day film festival started with the inauguration on 10th November, 2014. The legends who graced the occasion included Amitabh Bacchan, Jaya Bacchan, Aishwarya Rai Bacchan, Abhishek Bacchan, Tanuja, Shahrukh Khan and many others. The August gathering also saw Bengali legends like Ranjit Mullick, Madhabi Mukherjee, Moushumi Chatterjee, Moonmoon Sen and others. 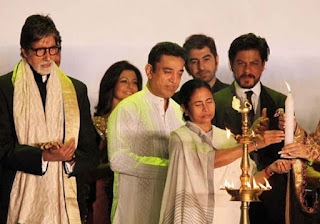 Shahrukh Khan in his short speech made sure that he could say something in Bengali. This is the third time he had inaugurated a film festival and he said in his own words that honest creation is what the spectators expect from the creators. Amitabh Bacchan gave an extended speech. He did huge homework for that. He emphasized on women empowerment. He mentioned that both in Bengali films and hindi films, the directors and writers emphasized on women’s social standing. Sarat Chandra Chatterjee’s Parineeta, Biraj Bahu told the same. Tagore’s stories also reflected them. While directors like Bimal Roy with films like Bandini, Sujata, Mehboob Khan with films like Mother India showed women’s individuality in Indian society, renowned Bengali directors like Satyajit Ray in his films Charulata, Pather Panchali had showed the different facets of women characters and also it was shown in films of other giants like Tapan Sinha who showed it in films like Jotugriha. Amitabh Bacchan’s speech was par excellence. Australian Filmmaker Paul Cox gave a brilliant speech explaining the importance of film festivals which brings expression of different countries and connects the countries together. Amol Palekar, Irfan Khan, Tanuja, Jaya Bacchan all congratulated the Bengali audience and the love for films in Bengal. Mamta Banerjee invited everyone and talked about the film festival showing films of 60 countries in Kolkata for the next 8 days. She also said what Bengal thinks today India thinks tomorrow. So Bengali writers, filmmakers and actors had been inspirations for other directors, actors of other parts of the world. So she expected everyone to enjoy the festival for the next few days. 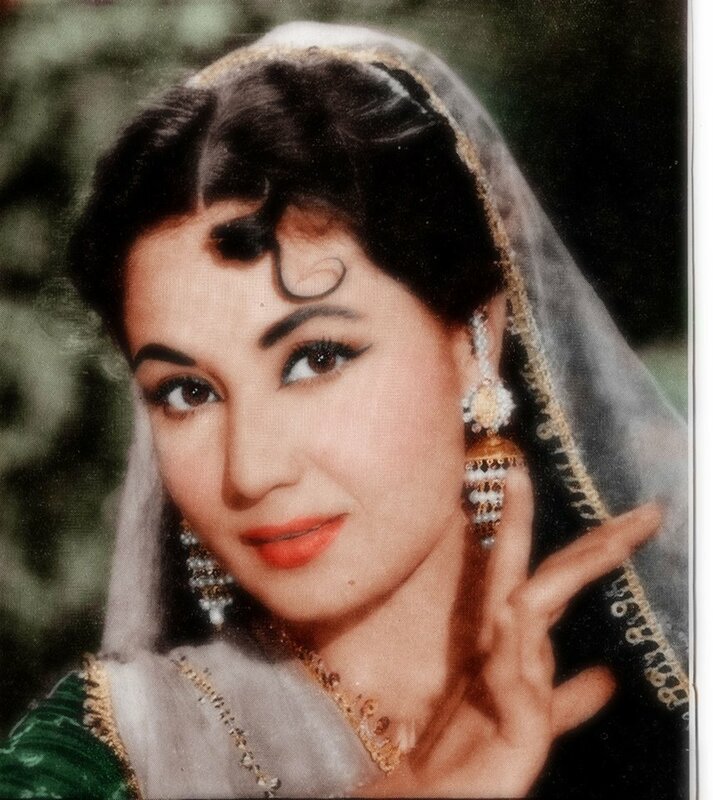 Legendary actress Meena Kumari is remembered on death anniversary. anniversary. The viewers of bollywood films remembered Tragedy Queen Meena Kumari both on her birth anniversary on 1st August, 2018 on her death anniversary on 31st March, 2019. Meena Kumari can be considered as the greatest actress of Bollywood during the golden age who had portrayed images and characters showing complexity of the mind of the Indian women and the social ostentations that they had faced during different periods of time. Meena Kumari, born on 1st August, 1932, known as Mahjabeen Bano, stormed into the Indian silver screen in 1952, with the sublime performance in Baiju Bawra. Although the film had been renowned for everlasting composition of Hindustani ragas by Naushad and supreme performance of Mohammad Rafi, with songs like “man tarpata”, “woh duniya ke rakhwale”, etc., Meena Kumari’s performance opposite Bharat Bhushan showed the filmlovers that she had come to conquer Bollywood with her soft style of acting. In the 50s Meena Kumari’s performance in films like Parineeta, 1953, Footpath, 1954, Yahudi, 1958, etc. were appreciated by critics, but she had created her image of martyr in the film Sharda, 1957, where even after having an affair with Raj Kapoor, in the film she had to sarcrifice her affection to marry Raj Mehra, his father, who was much older than her. In Dil Ek Mandir, 1963, Meena Kumari after having affair with Rajender Kumar in her youth had to marry Raj Kumar, due to social pressure. But from the time she had married Raj Kumar, she fulfilled all the duties of a middle class Hindu woman, and brought her sick husband to the hospital at the mercy of Rajender Kumar. She prayed to God, for the recovery of Raj Kumar. Rajender Kumar sacrificed his life to treat her husband and died at the end of the film. The songs composed by Shankar Jaikishan and sung by Rafi and Lata, had not lost their significance even today. In 1962, Meena Kumari, performed the role of choti bahu, in Guru Dutt’s Saheb Bibi aur Ghulam, the film showing the zamindari raj (dominance of Feudal lords) existing in the British capital in India, that is Kolkata. She was married to the youngest son in a family of zamindars who used to attend mujras in Jaan bazaar, in Kolkata, where performers from Lucknow, Benaras used to come and exhibit their skills of singing classical songs. She tried to retain her husband Rehman at home, and through her conversation, Guru Dutt, the observer came to know about the history of the family. Meena Kumar’s performance opposite Pradeep Kumar, used to create a different dimension, as her pardanashin image had matched with royal style of acting of Pradeep Kumar. After the success of Aarti, 1962; Meena Kumari, acted in the blockbusters Bheegi Raat, 1965, and Bahu Begum, 1967, opposite Pradeep Kumar and Ashok Kumar. In Bheegi Raat, she loved Pradeep Kumar, yet due to an accident which made her legs paralysed she could not attend the engagement and worked in the house of Ashok Kumar as governess. When society boycotted Ashok Kumar, she agreed to marry her, but presence of Pradeep Kumar at the end of the film in the song “dil jo na keh saka” compelled Ashok Kumar to sacrifice his affair and go back to London. It was a film where, Rafi, Lata, Roshan and the actors all had provided their best performance possible. Meena Kumar’s other film with Pradeep Kumar titled Chitralekha was also successful. Meena Kumari had become immortal with her classic performance in the film Pakeeza, 1971, opposite Raj Kumar, which took around 10 years to be completed. It was created on a subject related to women brought up in kotha and exhibited the class of women who could not give the recognition to their next generation as their father’s are not known. The music composed by Ghulam Mohammad, Lata and Rafi’s songs, Kamal Humrohi’s direction (the husband of Meena Kumari) all complemented each other, and the film became historical piece of document. The greatest hallmark of Meena Kumari lied in her ability to depict the helplessness of Indian women existing specially in the 50s and 60s, when the patriarchal society dominated them and they had no independent income to live separately against the pressure of society. In her performances, beauty, aristrocracy, tragedy, personality all blended into one. Whenever we think about cine-classics like Dil Apna aur Preet Parayi, 1960, or Ghazal, 1965, Meena Kumari’s image automatically comes in our mind. She died in 1972, only at an age of 41. Meena Kumari’s films should be restored in an archive for future generations to learn the art of understanding the characters from the core of the heart the way Meena Kumari had done during the golden age of Indian cinema. Received Doctorate Degree in Philosophy of law from National Law University, Jodhpur after submitting PhD Thesis in Law in National Law University, Jodhpur on the topic “Treatment of Cartels in India and USA”. Address: 22/6 Kalicharan Ghosh Road, Flat 1st Floor, Kolkata - 700050. West Bengal, India.